Gleim's FAA Test Prep contains everything you need to study for the Flight Engineer FAA knowledge tests in one unique, easy-to-use program. Create customized study and test sessions using the actual FAA airmen knowledge test questions to enhance your learning process. FAA Test Prep also emulates the computerized formats of the major computer-testing vendors, thereby giving you simulated exam-type conditions to determine your strengths and weaknesses. The Performance Analysis feature allows you to track your progress and focus on specific areas needing further study. Learn How to Study with Gleim's Test Prep software. Study sessions give you instant feedback on each answer with detailed explanations. Test sessions provide you with a simulated exam environment, the best way to test your understanding. Follow your progress as you take each study or test session. See where you need to improve and how well prepared you are for the FAA airmen knowledge test. Streamline your studies by only studying the areas in which you need to focus. Question and program updates are available via the Internet. FREE! Easy-to-understand Help files offer extensive information for users to help them get the best experience possible out of FAA Test Prep. Using a format similar to most windows programs, FAA Test Prep utilizes both the mouse and keyboard for maximum ease of use. 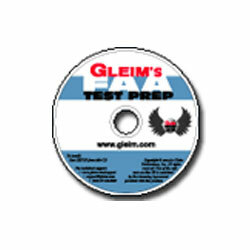 FAA Test Prep installs quickly and easily onto your computer. Designed specifically for the most popular operating systems on the market, FAA Test Prep is an excellent study solution for users of Windows 95 or later. This software is another powerful tool of our Knowledge Transfer System, and we want you to PASS your exam by using Gleim.